How did you feel when you received your first pay raise? I felt appreciated and happy. Receiving a pay raise for what I’ve considered menial helped transform it into memorable for me. I’ll remember hearing my supervisor who conducted my sixth month evaluation tell me I would receive my first raise in the next pay cycle. Transforming menial into memorable is a journey and adventure. In part one I described my experience of taking a job as a cashier at the local grocery store. I talked about wages, challenges and lessons I had learned in the first three months. I learned in my 90 day evaluation that my performance exceeded expectations and this pleased me. In this follow up article I will describe some more lessons I’ve learned about customer service, myself and evaluating my role at the store. I hope this will help you to reflect on your present job and circumstances so you can develop a strategy for transforming your menial into memorable. After six months of working in the grocery field, I’ve learned that it’s a challenging business. It’s 24/7. Incoming products must be sorted and stored, those products must be put on the shelves and a competent workforce is needed to provide the wide range of in-store services. I am still amazed at what I see going on to make the store ready for customers at the daily 7:00am opening, as well as, throughout the fifteen hours that it’s open. I’ve learned elements of opening, serving the public and closing a store. All of this is for the purpose of making shopping a pleasure for the customer and working a pleasure for my associates and me. I’ve learned that grocery work opens doors for me. It opens the door of my life to the customers as I converse with customers and associates. I’m revealing more and more about myself to the people I serve and work with. They’re getting to know me better the longer I work at the store. It opens the doors of peoples’ lives to me. I’m getting to know the ‘regulars’ and the snowbirds. I’ve heard the resentment of the regulars toward the tourists who crowd the roads and beaches. I’ve also heard the pain, faith and resilience of people who lost homes by Hurricane Michael. I’ve heard about health issues, family matters and a host of other concerns. Most recently, I learned that a grocery delivery man is suffering with shingles. I’ve been praying for him and asked his wife to tell him so. Helping customers and associates thrills me and gives me a feeling of significance. Service is an integral component of being a follower of Jesus for me. I’ve learned that some of my responsibilities are more appealing to me than others. I’m expected to do ones I like as well as the ones I don’t like to do. This makes me wonder at times if grocery work is for me in the long run, and it reminds me that I could explore other opportunities at the store. I like the social interaction in the front customer service department. It fits with my personality and giftedness, but I’ve found that some aspects of social interaction irritate me. Recognizing this makes me appreciate the variety of tasks included in the department. When I’ve been irritated by a customer, going outside to retrieve grocery carts helps me address my emotions and refocus. I reenter the store with a little more control of my emotions. 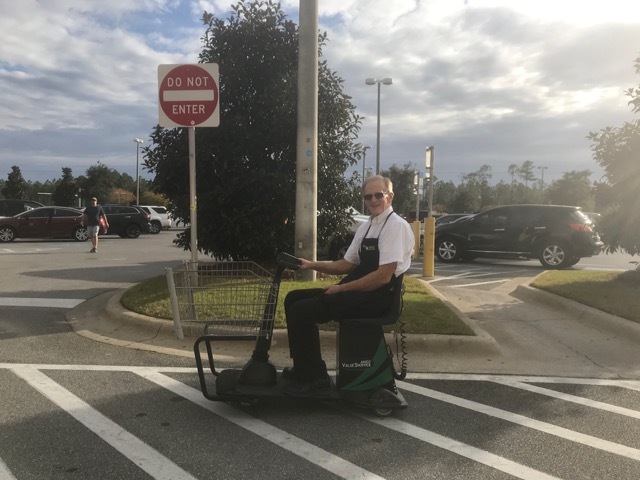 Finally, I’ve experienced the ever present desire to do as good a job as possible whether I’m cashiering, bagging, retrieving carts or cleaning the bathrooms. Recently, I wondered if Jesus would be pleased with the men’s bathroom I cleaned if he were physically present and needed to relieve himself. I hope so. This thought makes me urge you to identify the grand purpose for which you live. For me, it is remembering this mindset, “Whatever you do, work at it with all your heart, as working for the Lord, not for men….It is the Lord Christ you are serving.”(Colossians 3:23-24) Knowing your grand purpose can motivate you, encourage you and help you transform the menial into memorable. Transforming the menial into memorable can by various action steps. I would suggest that you try to see your job in the context of a bigger picture. I did this some in the third paragraph above. What is the bigger picture for the company or business you work for? How does your work fit into that bigger purpose? Will you commit to contributing to the fulfillment of the bigger picture? Instead of simply complaining about this task or that task, use your complaining to better understand your personality and giftedness. Working on one’s attitude is necessary, but learning about other opportunities at your company may be a helpful step. Beverly Keye and Julie Winkle Giulioni in their book Help Them Grow or Watch Them Go suggest that managers change the question for employees from what do you want to BE to what do you want to Do. We can use this distinction to clarify matters for us. Third and last, find ways to have fun. I took advantage of the Halloween Costume and the Christmas Eve Ugliest Sweater or Sunday Best Dress Up days for associates. I was very self-conscious, but my associates and the customers got a big kick out those who dressed up for each day. It was fun and definitely memorable. Decide to interject fun into your shift. Be considerate about it. Respect other people’s personalities, boundaries, and even their unwillingness to go along with your fun. You’ll find that it can transform the menial into memorable for you. Image courtesy of my sister-in-law Joy.